Mindy Jostyn grew up in San Jose, CA and Wellesley, MA. Already playing several instruments at age 11, she organized an all-girl ensemble called The Tigers. When boys came into the picture, she started writing about them and performing with them in a series of bands culminating with The Cyclone Rangers, a cover band that performed for a decade in and around New York City. 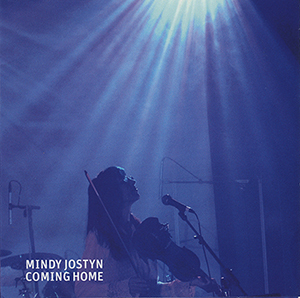 Mindy toured throughout the eastern United States wowing audiences with her soulful voice, distinctive melodies, witty and insightful lyrics, and her command of a host of different instruments including guitar, violin, harmonica, accordion, and piano. She headlined at legendary folk clubs such as the Bitter End in New York City, Club Passim in Cambridge, MA, and the Ironhorse in North Hampton, MA, and she performed at the Falcon Ridge, Winnipeg, and Long Island folk festivals.